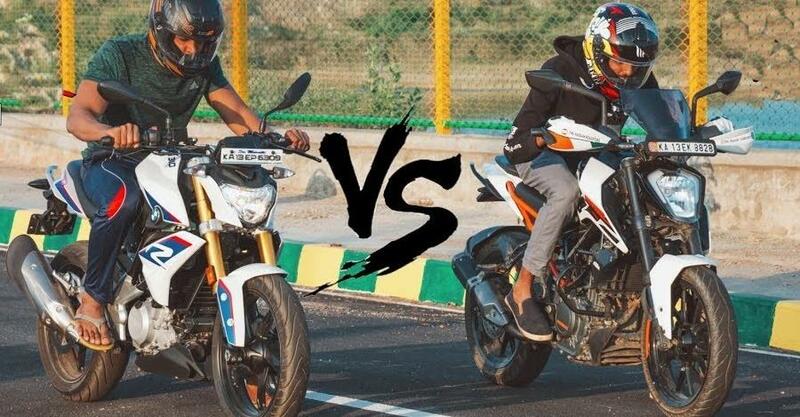 BMW G310R Vs KTM 250 Duke drag race: Who wins? The G310R is the most affordable BMW product that you can buy in India. It is priced at Rs. 2.99 lakh, ex-showroom. How does it compare with the KTM 250 Duke, which priced much lower at Rs. 1.8 lakh, ex-showroom, in a drag race? Well, here is a video that shows the exact difference between the two. The BMW G310R is more powerful than the KTM 250 Duke and that shows pretty well in the drag race. In the first round, the BMW G310R stays close to the KTM 250 Duke and then lurches ahead to gain a lead. The result remains the same even after swapping the riders. However, the BMW G310R fails to gain a convincing lead over the KTM 250 Duke over the short drag race. On longer roads, the BMW G310R will be well ahead of the KTM 250 Duke. As per data, the BMW G310R can do 0-100 km/h in 6.89 seconds while the KTM 250 Duke takes 8.49 seconds. The BMW G310R has been jointly developed by TVS and BMW. The bike is manufactured right here in India and is exported to the international markets. Powering the BMW G310R is a 313cc, single-cylinder, liquid-cooled engine that develops a maximum power of 33.6 Bhp and a peak torque of 28 Nm. It gets a six-speed transmission. The G310R is moderately loaded with features like 300mm front disc brake with 4-piston fixed calliper set-up. At the rear, it gets 240mm disc brake with the single-piston set-up. It gets dual-channel ABS as standard. The BMW G310R gets upside down 41mm front fork and a monoshock in the rear. The KTM 250 Duke is powered by a 248.8cc, single-cylinder, liquid-cooled engine that produces a maximum power of 30 Bhp at 9,000 rpm and a peak torque of 24 Nm at 7,500 rpm. It also gets a six-gear set-up. The KTM 250 Duke also gets upside down front forks with a monoshock in the rear. Both the front and rear wheels get disc brake set-up but there is no ABS available with the bike yet. However, soon all the bikes above 125cc will have to get offer mandatory ABS in the Indian market and we expect KTM to launch an updated version soon in the market. Coming to race, the KTM 250 Duke weighs 166 kg while the BMW G310R is much lighter at 158.5 kg. The difference in weight with higher power output makes the BMW G310R a winner in the race, even if by the fraction of a second. Both the bikes are entry-level performance bikes and target the youths in the Indian market. BMW was offering a discount of Rs. 70,000 on the G310 to attract the customers towards the end of 2018 but the offer has now been discontinued. The real competitor of the BMW G310R would be the KTM 390 Duke in the market not the 250 Duke.